I’ve rarely come across articles that describe the following phenomena, so when I received the following true story I was delighted to read it in its entirety. Imagine you are alone in the woods or some other remote place. Everything is quiet and serene. You let your mind take in the sounds and smells of the scenery that surrounds you. You start to relax and feel comfortable. Suddenly your calmness is jerked. You hear the crashing of rocks all around you. As suddenly as it starts, it stops. You look around…nothing. Not a soul within miles of you. Trying to make sense of what just happened you are pelted again. Rocks ranging from dime-sized to the size of a large grapefruit start crashing down from all over. As if it started raining rocks. Stopping once again as quickly as it started and never to happen again. The ‘rock throwing poltergeist’ is nothing new. I’ve covered these types of claims on GT before. Rarely do I read about this phenomena and even more rarely do I get to hear it from a person that witnessed it. What you are about to read is the true story of Scott S. While out fishing near his house, himself and two friends were suddenly under the direct path of falling rocks one day in 1975. What’s surprising is that only 30 miles away from his home, the same thing occurred. Only thing was, this occurred in 1922. On the last day of July 1975 my brother, a friend, and myself were witness to an event that I have failed to explain to this day. I was 12 years old, my brother was 10, and our friend was 11 years old. We lived in the small Northern California town of Willows. Willows is a small sleepy little farming community, most area farmers grew rice or safflower. A mile or so northeast of town was an old gravel mining area where abandoned gravel pits filled with ground water to create a small group of very natural looking but man made fishing ponds that the community used for recreational bass, panfish, and catfishing. My friends and family were no exceptions; we fished there on a weekly basis. So on this particular day my brother, our friend, and I gathered up our fishing gear and walked out to the ponds. The road to the ponds from town is typical of the area roadways, a slightly elevated two lane blacktop road which was straight and clear, it cut a path through wide open low lying farmland with open views in every direction, only a fewl farm homes were scattered through the area, and only a few small willow trees dotted the roadside, for the most part it was wide open space. The road had very little traffic on it; we found it quite safe to walk shoulder to shoulder right down the centerline all the way to the ponds. It was a clear cloudless summer sky and about mid day, we had arrived at our favorite fishing spot, a place right off the road we arrived on where it intersected a gravel road that cut across two of the ponds. We were all fishing facing East about 10 feet apart and watching our lines, there was no apparent wind or other disturbances, just a typical beautiful summer day by the water. Suddenly there was a loud splash out in front of us! Something had entered the water about 15 feet out in front of us, it must have to have been pretty large based on the splash it made, maybe 4-6 inches in diameter. We were startled and looked at each other thinking that one of us was goofing off and had tossed in a large rock in the water (major taboo while fishing!). After some blame tossing and head scratching we shrugged it off and kept fishing (with no luck BTW). A few minutes later….Another big splash, similar to the last one but further out, none of us were strong enough to heave a large rock that far, and we were now on high alert watching each other…..None of us did it! Now getting a little nervous, we started looking around for the culprits, none were found, we were absolutely alone out there with plenty of visible open farm land around us, we could see anything and everything within a half mile of us, there were no cars around, no machinery, no people, not even any animals, just low growing crops in flat farm land in every direction. There was no way any other person could have tossed those rocks! Suddenly more rocks fell; we stopped counting after a half dozen or so. All landed near to us, some on land, some in water, and variable in size from thumbnail to grapefruit sized. We picked up a couple rocks that fell near us to check them out, there was nothing unusual about them, they looked like normal rocks you’d find on the ground in the area. At this point we were downright scared; we picked up our fishing gear and started walking back down the road we arrived on. We walked right down the center of the road as before, not a single car came by on the way out or they way back. There were no noises or any other thing else out of the ordinary. As we walked down the road more rocks fell, mostly small ones about the size of a quarter, again, none hit us but fell close by, sometimes at our feet. When they hit the ground they bounced up as if they fell from quite a ways up. The rocks continued falling all the way back to town, just as we entered town the last one fell, it was a large one, a fist sized one that while falling smashed right into my fishing pole which was extended out in front of me as I walked breaking it in half! When we arrived home our father was there and we were pretty freaked out, he sort of smiled when we told our story and it was pretty obvious he didn’t believe it. My father was a mechanic and had lived and farmed in the area most of his life, you could say he’d pretty much seen it all in that area. He’s a very grounded person (as I am) and he just figured someone was messing with his kids and he was going to see exactly who it was. He owned an old Hot Rodded 57 Chevy step side pick up, it was faded black with a few rust colored primer spots. It wasn’t all that nice but it was his “baby”, he told us to get into the back and we’d take a ride out to the gravel pits to see what was going on. The ride out was uneventful except for our chatter about what we would discover, deep down inside I knew what had happened didn’t have a good explanation but I was hoping dad could figure it out. When we arrived at the gravel pits we all bailed out and looked around. It was calm and peaceful with no more rocks or anything else unusual, dad shrugged it off and said that he didn’t see anything or anyone around that could explain things so we loaded back up and headed back to town. Just as we started heading back a rock fell in the bed of the truck! Then a little ways further (doing 30-40mph) another rock hit the cab! Dad heard it and stopped the truck, he was mad because he thought someone threw a rock at his truck (the cab had a small dent where it hit). Again, nothing was seen or heard in any direction. We then headed back to town with no further rocks falling on us. That is the conclusion of my story. The next day, August 01, 1975, there was a 6.1 earthquake at the Oroville Dam (a small dam about 45 miles East of Willows). We felt it in Willows when it occurred. I don’t know if the events are somehow connected but thought it was worth mentioning. I am now 48 years old, live and work in the city of Spokane Washington. I not, nor have I ever been, a big believer in supernatural events, ghosts, or other phenomena’s. I have been a naturalist most of my life and have found logical explanations for nearly everything I’ve encountered in life, all but this one thing and it’s frustrated me ever since. Imagine how I felt when I saw this old show on TV last year! I had chills up my spine! Chico is only 30 miles from where it happened to me! Watch this show, “The Ghost” from the series “One Step Beyond”. It was more dramatic and put a twist on the source of the rocks that I had not considered, but it was a very similar occurrence and was so close to where it happened to me! BC, care to share your 12-yr-old-you psi related events? I recall reading some book that described other odd events where things fell out of the sky like frogs or fish, etc. They usually explained it as a specific type of tornado that pulled the objects very high into the sky and then having them fall in mass on an area. Quite often such things happen as the result of a tornado or micro burst. Such wind anomalies can pick up objects and even animals or fish (water spouts) and throw them over great distances. I am a believer in paranormal things. I have seen UFO’s , and have an open mind. I also used to play with explosives as a kid. A good blast of say , 50 lbs of anfo can throw rocks well over a mile. Depending on the wind direction it may be possible the rocks were thrown father away than the sound could be heard. The story even says in was in an area where mining was taking place. even if the mine was closed , some people could have been having fun with explosives illegally , I used to do that kind of stuff as a kid. When I was about 9 or 10 years old, several large rocks approximatly grapefruit sized fell down all around me and since I was stuck in thorns- I was in the woods-I could not run. One of my friends was with me and she will not talk about it even to this day. Might be space rocks! Might be gold falling down on you! Next time it happens, see if they are magnetic and heavier then normal rocks and have them tested at a lab! They could be worth thousands, that is what I heard! Maybe the Gods or UFO entities are sending you a gift!It could be good stuff! Smile when they do and thank them also! Leave them a gift of tabaco..That is what the Natives would do to thank them! Inappropriate photo: There is no connection between the contents of the submitted article and the photo of the “moving rock racetrack” in the lead photo. 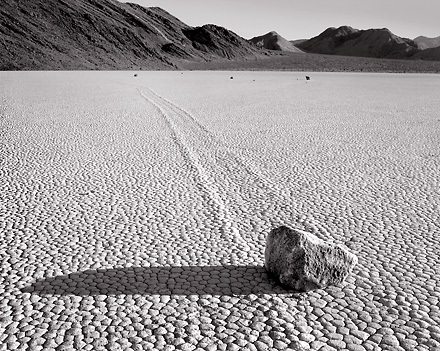 These “floating stones” in the photo are in one place in the world (Death Valley) whereas the “falling stones” associated with poltergeists are reported as world-wide phenomena. There is a suitable explanation for the racetrack playa, although not obvious at first, which “seems” to make it mysterious. There is no suitable explanation for the poltergeist falling rocks. Searches for “moving rock racetrack” will all lead you to the same geographical locality. Otherwise, after reading the Wikipedia article, follow some of its external links. I’m thinking Bigfoot. They have been known (or surmised) to throw rocks and boulders. Some alien was riding his UFO with some rocks in it cause he was interested in our planet earth but by mistake he pressed the button “ADFKASPFKAF[KASFSA[FKALSFLAKSFL;ASK” Which means “Dump” and thats what really happened. The “mine” was not what you might be imagining, it was simply large gravel pit with a small portable conveyor set up parked next to the edge, an excavator would scoop gravel from the ground/hole, dump it onto the conveyor, and be conveyed up an open belt up into a dump truck parked under the opposite end to be hauled away. This setup was about 200 yards away from where we were fishing. Not only that, this operation had long since been abandoned and was not active then, all that remained was the old conveyor. There was never any blasting done in the area for mining purposes so that rules that out. BTW, to this day I have not experienced anything unexplainable. I am not a big believer in paranormal, the rocks from the sky story is absolutely true, unexaggerated and unembellished. I wish I knew what the heck it was all about but so far a reasonable explaination has eluded me.